Southern Thailand is known for it’s beaches. Northern Thailand? Not so much. Northern Thailand is cooler and more rural with mountanous terrain increasing as you move north. But if you want, you can still go to the beach in Northern Thailand. 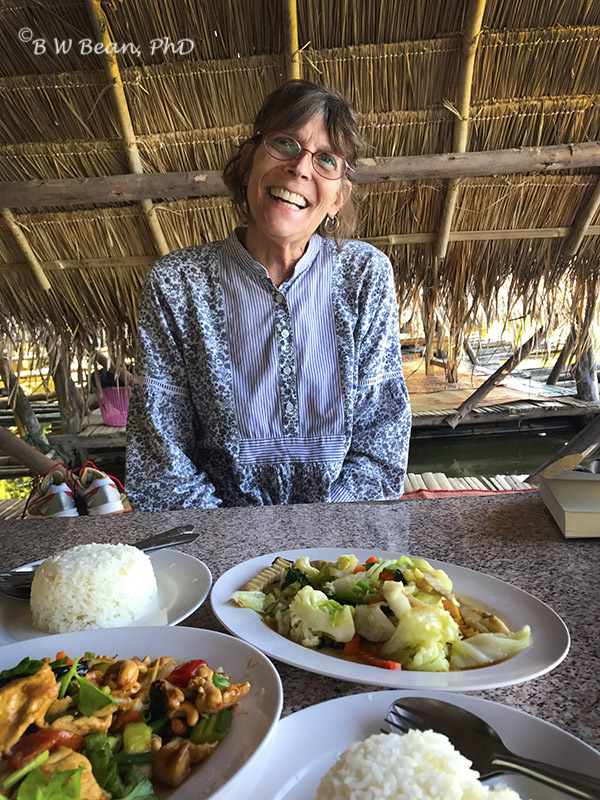 Huay Tung Tao Lake is one option. It’s a great place to spend a quiet relaxing day. 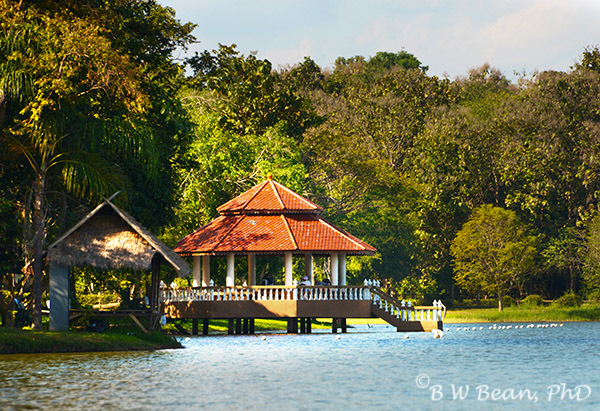 The lake, actually a reservoir, is located only 13 km north of Chiang Mai, at the northeastern base of Doi Suthep. 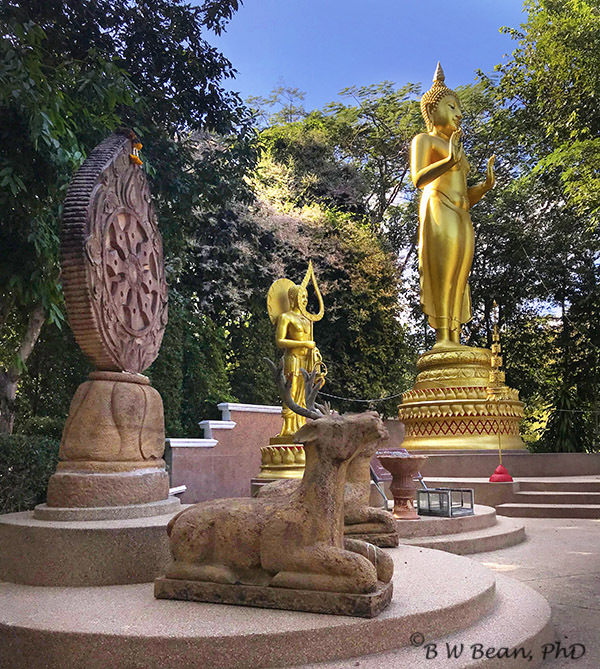 It’s proximity to Chiang Mai makes it a simple trip for the day or just an afternoon. 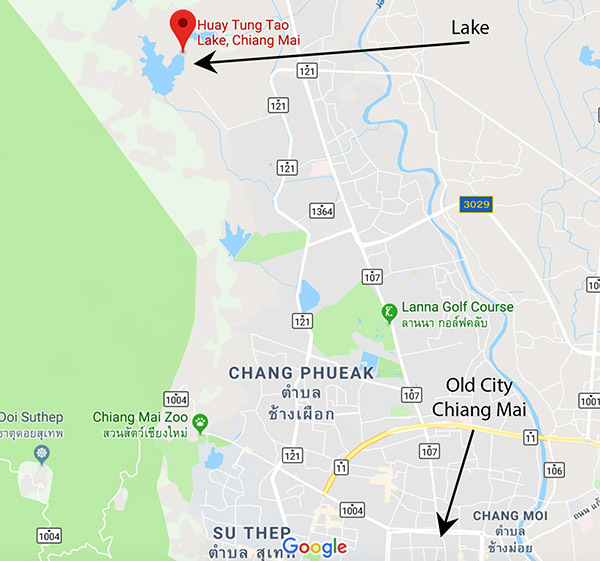 If you have a car or scooter it is an easy 20 to 30 minute drive to the lake from Chiang Mai. 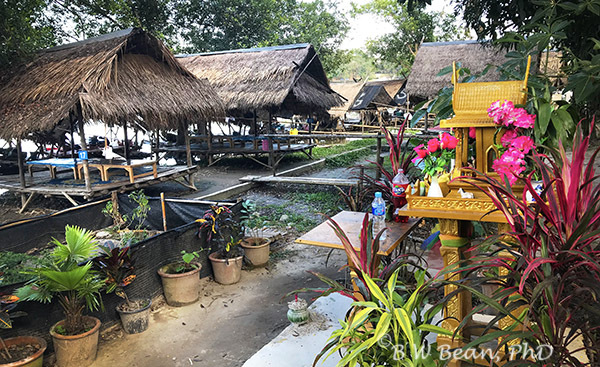 The lake area is also served by Uber with a ride costing around 125 baht. The lake is a controlled access area. The entrance fee is 20 baht for Thais and 50 baht for foreigners. It’s a very popular spot with locals and gets rather busy during the weekend. During the week, however, it is very quiet with few people about. A day at Huay Tung Tao is a lovely break from Chiang Mai. The lake area is peaceful and quiet and is surrounded by numerous small local restaurant operations. 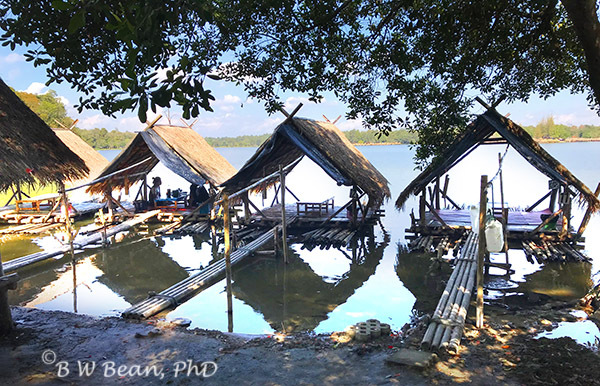 Each has it’s own set of small individual floating bamboo “rafts” which hold up to about 6 people. 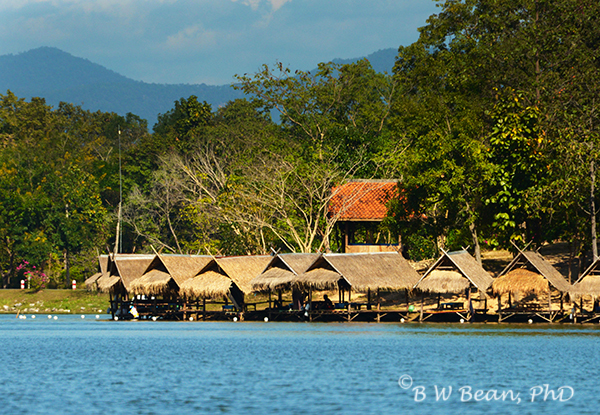 Each raft is attached to the shore and accessed by a bamboo walkway. Your party can rent its own raft for the day for 20 baht per person. Each raft is open sided and covered with a thatched roof. The floor area is covered with mats and there is a low table in the center. Staff from the restaurant will come to your raft and take food and drink orders and deliver your items to you. All you have to do is relax and hang out on the raft. 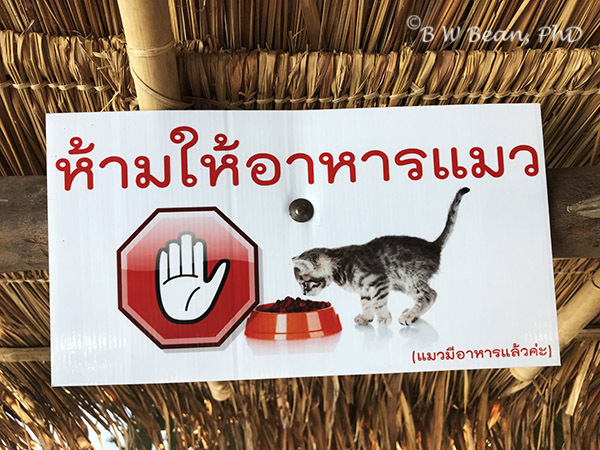 Do Not Feed Cats On The Raft! 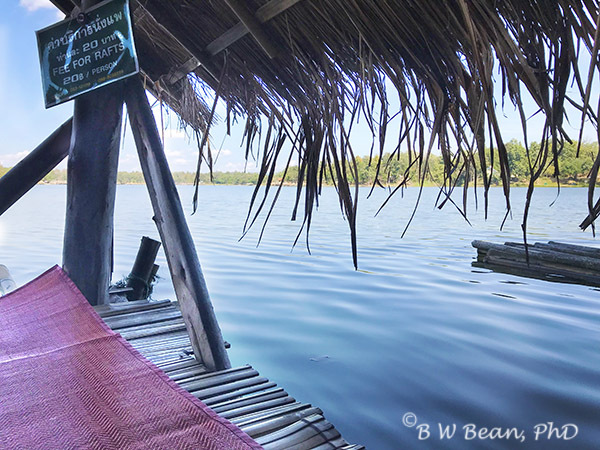 A day at Huay Tun Tao Lake is a very laid back and chill experience. Relax in the shade on your raft. Have a nice lunch – maybe snacks later. Take a nap. Read a book. Enjoy the cool breeze. Take a walk along the lake shore. Make some photos. Stop at the gazebo where you can buy some fish food and feed the fish. You never know who you might bump into at the lake. 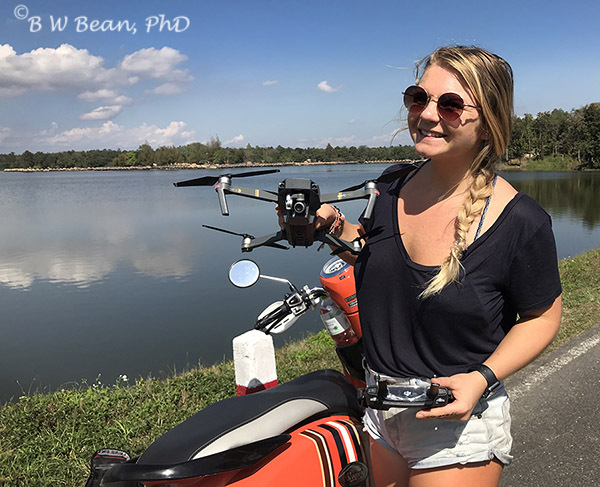 While walking around the shore I met Savanna, a young traveler and “vlogger” who was enjoying the afternoon as she was flying her DJI Mavick Drone over the lake. Savanna is a New Zealander who has been traveling and working around the world for the past year. You can view Her Youtube Videos Here and Her Instagram Photos Here. You will also discover some Buddhist shrines and statues. This is Thailand after all. TAKE A RELAXING DAY AT THE LAKE …….. AND ENJOY THE ADVENTURE!